There are several executives, entrepreneurs and consultants who are known to us for working 80 hours a week and sometimes more. This is not an uncommon thing for them and can often go more than 100 hours. But of course this doesn’t mean these guys don’t know how to enjoy their lives or don’t have time for their relationships? Of course they do! In this post you will learn on how to balance both your life and work in a successful way without having to feel like you’re going to pass out. So keep reading to find out! 1. Is it possible to work 80 hours a week? Of course, it is possible! But it is difficult. If you want to work for 80 hours a week, you have to follow a particular schedule. Only then you will be able to enjoy your life to the fullest. So to make sure you are able to do that, we have enlisted some expert tips and ideas in this post that will definitely help. But before we get to that, let us first find out if working 80 hours a week is legal. 2. Is it legal to work 80 hours per week? There are certain laws in the states that allow people 80 hours work week but there are a few considerations that come along with it. You will be paid more and most importantly, only certain sectors will allow such kinds of jobs such as the administrative, professional, executive and outside sales department. And in some places if an 80 hour work week has been scheduled, then you will be paid according to the hours worked. It all depends upon the place you are working for! These tips have been enlisted by professionals and would be great if you could follow them! Of course these tips are all tried and tested and would not fail you one single bit. So keep reading to find out what it really is! Now Tomasz Kucemba works around 100 hours in a week at times and can give you great tips on how to survive for 80 hours like a pro! According to him, he does not have a life really outside work. An example can be used to explain this. If he is at the moment planning out an event with someone, trying to prepare for an international meeting over the phone and trying to come up with ideas to take his girlfriend for the Dallas Food Festival, he will use his smartphone for a whole lot of multitasking. Apparently, it is a lifesaver and keeps him going always! He also suggests that panicking is always a bad idea and that you should always stay calm. Learn how to manage your time and you will surely be able to reap all the benefits. Kucema also advises people to pay attention to fitness. They should eat vegetarian as much as possible as it will double up your energy. Also take a few health supplements that don’t have any side effects. That may be good for you as well. This CEO also works around 80 hours a week and has been building on his passion for over 15 years. He begins his day with a cup of coffee and tries to make time for his hobbies as well. Want to know how? Keep reading to find out! The CEO finds a balance in life by simply spending time with his family no matter how tough his schedule is. He never misses any of his daughter’s big events. He is always there for her! You should always deal with your emails late at night before you go to bed and again in the morning, you should follow things up and clear it as fast and possible. There is no way you should keep this section incomplete before coming to work. Small things like these should not distract you in office work hours. Try to stay focused as much as you can, and get rid of any sort of distractions or opportunities unless you have completed the bulk of work that is given to you. You should do what you love doing and do as much as you want to. Even though there will be stress but in case you do love it, it will certainly become one of the processes and not just any job. These are some interesting ideas that will prepare you for the long hours of work ahead and let you work tension free!! The first thing you need to do is make a list of all those people you love and start apologizing to them one by one because you are going to get super busy very soon and won’t have time for them for a while. The first thing I would do is call my spouse and let him know that we might have to cancel on a few things this week as I will be working too much like 80 hours or so. The next thing I will do is call up my parents and relatives and let them know that giving them time might not be all that possible since I will be caught up with a few stuff. You should actually do the same! The second thing we would advise you to do is give fitness some importance. You should go to the gym at least three times a week, give up on junk food altogether, eat healthier meals, balance your eating habits and eat more greens if possible. Add more water and green tea to your diet and make sure to get enough sleep at night. You have a tough time ahead of you so you must know to eat right. If you start having fries and pizzas every day, you will probably not be able to survive an 80 hour week. A third thing we would like you to try is refreshing yourself during holidays and vacations. As you all know holidays are a great time for you to relax and enjoy yourself. This helps you to be able to work more harder and even better at work. You can try the mountains, the beaches or a nice resort where you can forget everything and completely enjoy yourself for a bit. Being alone is a good thing and you should utilize this period because in the future you will need all that stored energy. Now coffee is very bad for your health and we would suggest you to give up on it right away. Coffee contains caffeine which could lead to several health hazards if taken regularly. If you really want to drink something, we would suggest you to have green tea or water. Even a cup of tea without sugar is okay but coffee… no way! Stay away from other drinks like red bulls and cola as well. They will make you feel lazy and lethargic which I am sure you want to avoid. Decaffeinated juices are also a great idea. Don’t forget to keep in touch with your teammates and your boss. Speak to them on a regular basis. It could actually feel pretty bad if you don’t have much communication with them. Your team always looks up to you so make sure you are spending enough time with them. So instead of stressing out so much, communicate with them on a regular basis and don’t waste any more time. Now the Swedish tradition is pretty easy and has been tried by a large number of experts. You should as well if you want to survive at work. In Sweden, there is something called the 3pm Fika. Fika means to stop at whatever you are doing. You need to get up right there and then and give yourself a 15 minute break. During this time you should relax yourself and grab some coffee with a friend of yours. Have more coffee and tea with biscuits and catch up on old gossip. Another tip that will always works at work is showing some sense of creativity. Do all those things that you love doing or at least because of believe in this vision. Work should definitely be an outlet for you to explore yourself and your creativity. So if you are working long hours, there should be something that energizes you and makes you feel good. Creativity will, in that way help! No matter what goes on, you should keep two hours for yourself per day. The day has 24 hours and you are not going to be working all the time and work all day. So there is absolutely nothing wrong in giving yourself some time. Take one of your friends out for dinner or have dinner with your husband, take your dog for a long walk or cover long distances by walking. These things will make you feel happy and let you work for long hours without having you realize any. Our final advice to you would be to make one a no work day. On this day, you can go camping, hiking or go on a picnic with some friends. You should cherish this day and spend time on your own. Enjoy yourself as much as you like as this will be a fine opportunity for you to get off your computer and be with those who really matter to you. Plus having one day as no work day would be an ideal thing to do. Hope you have found this post really helpful and if you want to work in a professional environment that expects from you long working hours, then these tips should definitely be used at least once. But yes! Make sure to pick a wise decision. 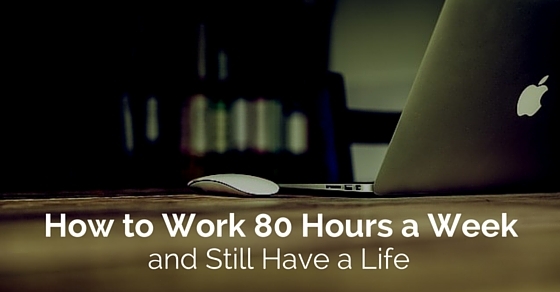 You don’t have to be stuck in a job for the rest of your life where you have to work for 80 hours per week. That would be sheer torture if not anything else. On that note, the post will here come to an end. If you have some feedback to give, please let us know in the comment box below. We also look forward to your questions. Till then, good luck and take care!